At breakfast on the day of the 2002 Audi Cabrio press launch, some radio ‘Dr Death’ was warning that 1,600 Brits a year die of skin cancer. 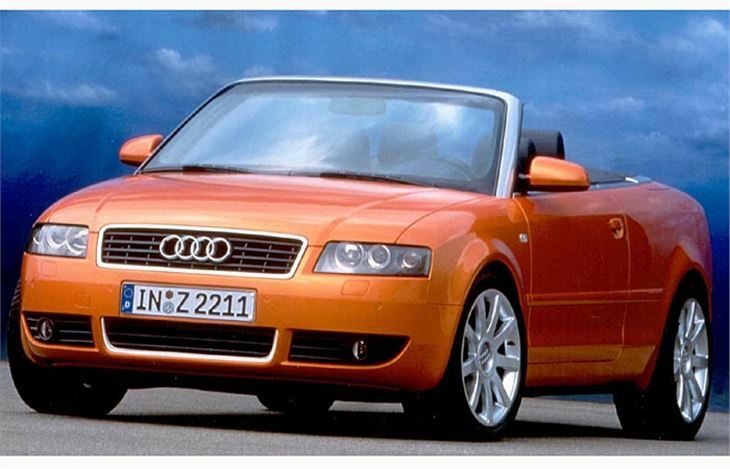 He gloomed that one reason is our obsession with convertibles; something it seems we share with the Germans. After all, you don’t see many French and Italian owned convertibles. And you hardly see any with Spanish plates. Come to think of it, you hardly ever see any Spanish cars with a sunroof. But us British lads and lasses like to get our tops off at the first glimpse of sunshine. 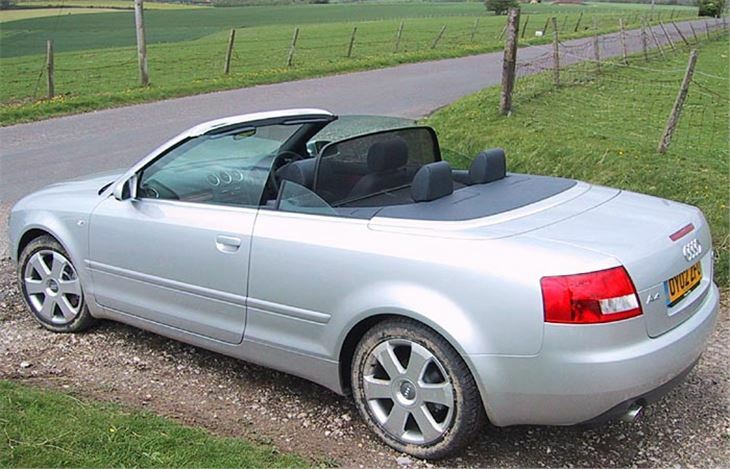 Something the Audi Cabrio enables us to do in 26 seconds from standstill. In fact, no movement at all is allowed during this delicate disrobing. Foot must be firmly on the brake and gears in neutral or ‘park’. And it has to be said that, though the Audi Cabrio is a good looker with its roof up, it’s a real stunner with its roof down. Neat, beautifully proportioned and no ugly bumps where the hood tucked itself away. Just a single unbroken line from front to rump. Drop-top gorgeous. The trouble is, if you want to look gorgeous driving it you’re going to have to restrict yourself to posing. Because if you get a move on you’ll need the windows up and the optional folding windbreak in place. And, if you pay any attention to Dr Death, you’ll wear a cap with at least Factor 15 on your bare bits. We tried both the 220 bhp 3.0 V6 with a 6-ratio Multitronic automatic gearbox and the 170 bhp 2.4 V6 with a manual 5-speeder. Though they sit on the same floorpan as the classy new A4, not a single body panel is shared. Extra strengthening makes the new car 112% stiffer than the old Cabrio and cuts the amount of ‘hippy hippy shake’ on bumpy corners. You still get a little bit if you’re clumsy with the power, but certainly not enough to chatter the teeth of your expensively acquired smile. Though it corners well, the front end feels heavy and you could never call the car nimble in the manner of, say, a MINI Cooper. It’s no boy racer. You don’t get a feeling of raw power from that 220bhp, nor do you feel like Michael Schumacher button-changing the box up and down. You also have to be patient when selecting ‘Reverse’ from ‘Drive’. Not that any of this is relevant. After all, how many BMW M3 convertible owners ever exploit their car’s outrageous 343bhp? Most drive them and lesser BMW convertibles slowly to give the world a chance to admire and envy them in their expensive status symbols. 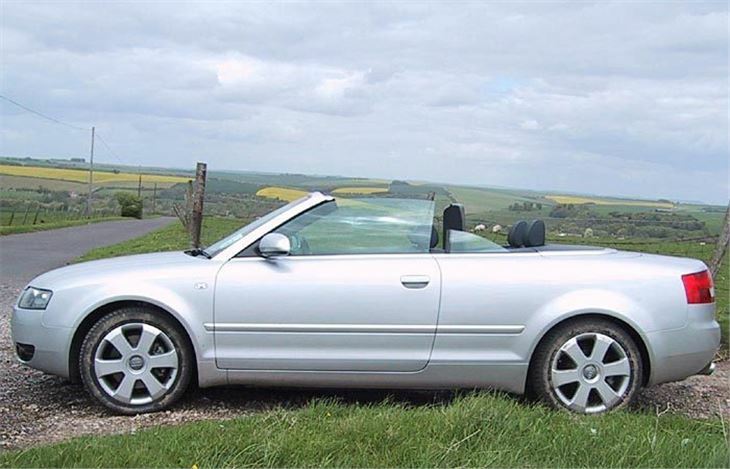 Audi Cabrio buyers tend to be less into Footballers Wives and more into understated cool. As proof of this, count the bottle blondes driving drop-top BMWs. Then count how many you see in Audi Cabrios. Strangely enough, the much milder, sweeter revving 170bhp 2.4 is the nicer car to drive. And something of a bargain at the right side of £25k. 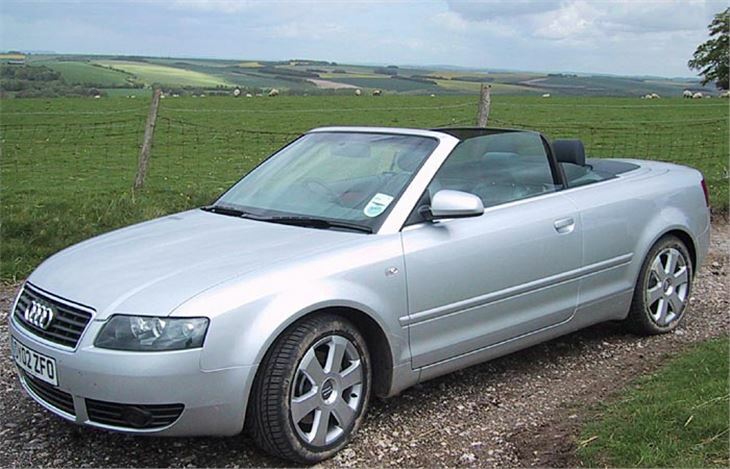 Because, thought the BMW 318i convertible has now had a power hike to 143bhp, it still kicks off dearer at £25,220. And to get 168bhp you have to stump up £26,500 for the 2.2 litre 320i. 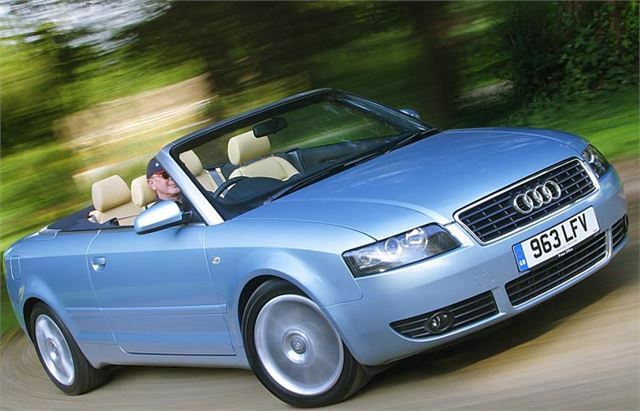 While I’m counting beans I’d also better point out that, at £27,470, the 220bhp Audi 3.0 Cabrio undercuts the 189bhp Be Em 325i convertible by £710 and the 227bhp 330i convertible by £3,470. Yes, I know money doesn’t matter once you’re looking at £30k+. But it does at entry level and there’s no doubt in my mind which is better value for £25k. For your £3,500 over the cost of an A4 2.3 SE saloon you get a lot of other things besides the looks and the soft-top. You get pop-up rear roll-over protectors just in case the unimaginable ever happens. There’s special device inside the boot that enables you to increase its capacity when the hood is up. 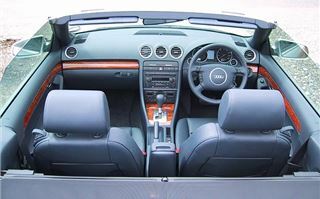 The glovebox centrally locks when you lock the car and the inside is protected by a microwaves so anyone sticking their hand inside will set off the alarm. There’s a new console. A passenger airbag disabling switch. Even a 12v socket in the boot to power an Eskie or a compressor to inflate a dinghy. But one thing I didn’t like were the no-charge optional protruding ‘seven arm’ alloy wheels. Make sure you go for one of the other designs, preferably with wider 215 tyres, or you’re going to crunch your alloys the first time you pull up to a kerb. It might seem a bit strange but the next engine option planned isn’t a cooking 2.0 litre 130bhp four. It’s the 155bhp V6 TDI, with optional Multitronic box. 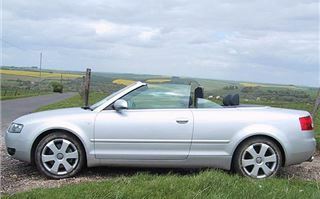 Apparently German mums and dads have a thing about diesel convertibles and 20% of the old Cabrio sold in The Fatherland were oil burners. The big benefit of this here, of course, is reduced CO2 output which, in turn, cuts company car BIK tax liability. Not too sure what it does for the driver’s chances, though, as he rattles past gaggles of girls sitting outside the local wine bar. He might as well have a ‘Definitely Married with Kids’ sign hanging on the back. So should you get your order in now? You might be too late because, as is the way with new convertibles, this Summer’s RHD allocation was sold out six months ago. You could, of course, pay a premium. Or order now for summer 2003. If you do, then go for the neat, sweet 2.4, spec it up with leather, avoid the sticky-out alloys and look forward to a long hot one.